The detection times in urine are significantly greater than detection times in blood, which is also generally much more expensive. The presence of a drug or drugs in urine does not provide information as to whether the individual is actually under the influence at any particular time. Likewise, no determination can be made from urine as to the amount of the dose or the time of the dose. Blood testing, on the other hand may provide more suitable information about whether or not an individual is “under the influence”, though this may not be conclusive in all cases. Urine drug testing accuracy is variable depending on how the testing is done. Drug testing is extremely accurate and reliable when all aspects of the testing process are done properly. On the other hand, the information obtained may be very misleading and inaccurate when poor procedures or testing methods are utilized. Drug testing will only be reliable when the consumer knows how it should be done and then demands from the industry that it is done properly. 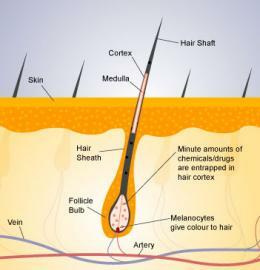 Using a small sample of hair cut from the scalp, hair analysis evaluates the number of drug metabolites embedded inside the hair shaft. When compared to more traditional forms of testing (i.e, urine testing), hair samples can detect a longer period of drug use. With urine, most drugs are undetectable if urinalysis is carried out more than 2-3 days after use, with the exception of cannabis, which may be detected for slightly longer periods of time. After the 2-3 day period, a urine donor will test negative and slip through the urine screening process. With hair samples, the only time limitation for detecting drug usage is imposed by the length of the donor’s hair. Every half inch of head hair in length provides a 30-day history of drug use. The standard for the industry is to test 1.5 inches, which provides a 90-day history of the donor’s drug use. If no head hair is available, body hair can be used. This provides longer window of detection of approximately 365 days. Bleaches, shampoos and external contaminants (i.e. cannabis smoke) have no known impact on the results. RTL now offers ethyl glucuronide (EtG) testing. EtG is a direct metabolite of beverage alcohol (ethanol). Its presence in urine may be used to detect recent alcohol consumption, even after ethanol is no longer measurable. The presence of EtG in urine is a definitive indicator that alcohol was ingested. EtG is detectable in urine for up to 80 hours after the elimination of alcohol. EtG is only evident when alcohol is consumed and is not produced as a result of fermentation.